President Trump was clear about ending "war games," but conversations on Capitol Hill indicate some form of U.S.-South Korea training will continue. There seems to be some confusion about the future of U.S.-South Korea military drills. 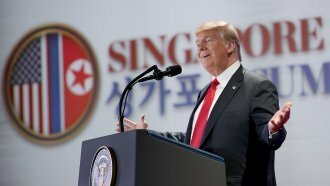 Tuesday in Singapore, President Donald Trump said, "We will be stopping the war games, which will save us a tremendous amount of money, unless and until we see the future negotiation is not going along like it should." The U.S. and South Korea regularly hold joint military exercises. But from the president's statement, it's unclear which of those drills qualify as "war games." Back in Washington, D.C., Vice President Mike Pence met with Republican senators Tuesday, and according to Sen. Cory Gardner, Pence said military exercises will continue. Pence's office quickly refuted that claim. But Gardner doubled down, tweeting, "@VP was very clear: regular readiness training and training exchanges will continue." It appears the vice president's press secretary confirmed that Gardner statement by retweeting it from her official account without any additional comment. It seems like this all comes down to word choice — war games, military exercises, regular readiness training and training exchanges. And that still leaves some room for interpretation. Trump was clear in saying "war games" would not continue. But it seems we'll need further guidance on what qualifies as a "war game" as opposed to other types of joint training.